New developments in nucleophilic additions to nitrones -P. Merino. 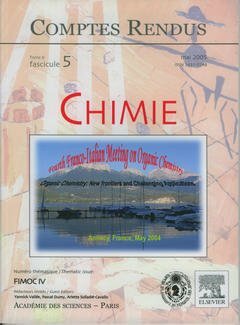 The oxime bond formation as a useful tool for the preparation of oligonucleotide conjugates -Y. Singh, O. P. Edupuganti, M. Villien, É. Defrancq, P. Dumy. Nitrosation and nitration of bioactive molecules: toward the basis of disease and its prevention -M. d'Ischia. Inhibitors of tyrosine kinase proteins induced Ras signaling pathway as potential anti-tumor agents -M.Vidal, W.-Q. Liu, B. Gril, C Lenoir, C. Garbay. Stereocontrol in reactions of cyclic and acyclic ß-silyl radicals Y. Landais. Template-directed combinatorial surface assembly for protein-protein interaction mimetics -S. Plé, M. Figuet, P. Dumy. Towards a novel synthesis of eleuthesides -S. Samaritani, H. Bruyère, S. Ballereau, J. Royer. Can functionalized N-acyloxy aziridines be easily deprotected? - S. Fioravanti, A. Morreale, L. Pellacani, P.-A. Tardella. Biocatalytic reduction of (+)- and (-)-carvone by bacteria -M.-R. Cramarossa, A. Nadini, M. Bondi, P. Messi, U.-M. Pagnoni, L. Forti. Époxydation des alcènes mixtes fluorés-hydrogénés par le système RuCl3-bipyridine-NaIO4. Rôle du ligand azoté -A. Banu, R. Stan, H. Matondo, É. Perez, I. Rico-Lattes, A. Lattes. Synthesis of glycopeptides derived from L-glutamic acid and D-fructose analogues -F. Minassian. Enantioselective synthesis of the fragrance trans-magnolione under asymmetric phase transfer catalysis - S. Superchi, M. Nardiello, M.-I. Donnoli, P. Scafato, R. Menicagli, C. Rosini. Thiazolidines to lock cis Xaa-Pro amide bond: new synthetic approach -S. Chierici, M. Figuet, A. Dettori, P. Dumy. Calixarenes for metal cations extraction -I. Dumazet-Bonnamour, H. Halouani, F. Oueslati, R. Lamartine. Micro- and nanotechnologies: dullish electrons and smart molecules -J. Simon. Étude de la photoréticulation par DPC de deux systèmes TEGAA/photoamorceur et Bis-GAA/photoamorceur - S. Bayou, M. Mouzali, M.J.M. Abadie. Syntheses and properties of phosphonate p-conjugated of pyridine -R. Frantz, J.-O. Durand, M. Granier. Extraction de l'argent par des gels d'acide polyacrylique-polyacrylate de sodium. Application à l'élimination des ions chlorures -El-H. Rifi, D. Lakkis, J.F. M. Leroy. Computational prediction of the absolute configuration of stereogenic carbon center -M. Santelli.